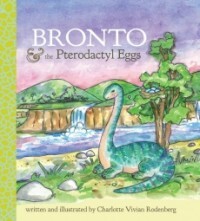 In Bronto & the Pterodactyl Eggs, first-time author and illustrator Charlotte Vivian Rodenberg brings to us a heartwarming tale of one lone Apatosaurus who must protect a nest of tiny pterodactyls from the dangers of the Jurassic. Through breathtaking watercolor and ink paintings, and a language for all ages, we are carried to a world of unexpected joy as we discover Bronto, his heart as big and warm as the afternoon sun, and four of the world’s newest dino-fledglings! What I Loved: The storyline reminded me a bit of "Are You My Mother?" which is a staple around this house. Only in this story, the eggs don't realize their mother is missing, and it is up to a friendly Brontosaurus to save the day. I love that the bronto takes responsibility for the problem, and then takes action when necessary. I also love the illustrations. They're beautiful and accessible to pre-schoolers while still being enjoyable for adults. I also loved that the author took little opportunities to give facts about brontosauruses and volcanoes in a way that didn't detract from the story. Overall, this is a heartwarming, lovely story about the value of kindness and about doing the right thing.